Due to its prolific reproduction and the external development of the transparent embryo, the zebrafish is the prime model for genetic and developmental studies, as well as research in genomics. While genetically distant from humans, nonetheless the vertebrate zebrafish has comparable organs and tissues that make it the model organism for study of vertebrate development. This book, one of two new volumes in the Reliable Lab Solutions series dealing with zebrafish, brings together a robust and up-to-date collection of time-tested methods presented by the world’s leading scientists. 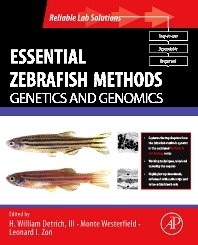 Culled from previously published chapters in Methods in Cell Biology and updated by the original authors where relevant, it provides a comprehensive collection of protocols describing the most widely used techniques relevant to the study of zebrafish genetics and genomics. The methods in this volume were hand-selected by the editors, whose goal was to a provide a handy and cost-effective collection of fail-safe methods, tips, and "tricks of the trade" to both experienced researchers and more junior members in the lab.